Readymade suits are great when you don;t have any time, but if you want the best fit for your body type, head out to one of Kolkata's tailoring joints. These bespoke tailoring joints will make you a suit with the perfect fit. And you can choose a fabric that fits your budget too. JS Mohamedally has been around since 1909. Cricketer Salim Durrani was a customer here. For the choicest fabrics head to this iconic men’s wear store near Esplanade and Dalhousie Square. Their cabinets are full of smooth English cottons, tweeds, and Madras plaids. These guys have been around since the 1940s, and are well-versed with all the hallmarks of a well-made suit. The owner, Ajit Singh, has been to the Mecca of bespoke suits – Savile Row in London – to hone his skills in tailoring. He was even featured in The New York Times. They may be one of the oldest tailoring joints around, but they know cool. 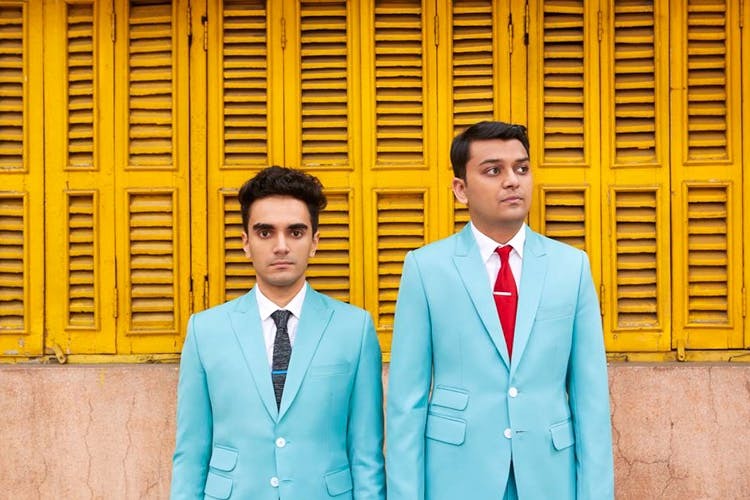 Have you watched that music video by Kolkata-based musicians Parekh and Singh (check the feature photo)? The one making rounds of the music circuit here and abroad, and winning rave reviews? The video which filmmaker Wes Anderson loved and shared on his Facebook? Those cool threads were tailored at Barkat Ali & Bros.
Raymond’s chain of stores are pretty well known — most have in-house custom tailoring facilities called Stitch-Without-A-Hitch. They have master cutters and tailors who are trained with the latest methods and equipments. Select from the wide range of fabrics in their stock. They say that you don’t have to visit again for trials and fitting, and that the fit will be just right every time. This store off Park Street (opposite Mocambo) has been around since 1962. It stocks unique and exclusive designs of the in-house designer and owner Ratul Sood. It has two major segments, one on wedding collection and the other completely devoted to tailoring. Innovative designs, superb fit and high-quality fabrics mark the clothes of this popular fashion designer. They also do Indo-Western outfits very well (such as Nehru jackets, harem pants and jodhpuris). The fabrics are imported mainly from Italy’s top fashion houses such as Dormeuil, Vitale Barberis Canonico, Loro Piana, etc. The area around New Market is full of shops (like Sumangal) who stock readymade suits as well as a range of great fabrics and will tailor a jacket or suit for you in a jiffy. These places are very popular with Kolkata’s young crowd. Just before winter and the wedding season Christmas and New Year parties begin, you will find the stores full of customers looking for something snazzy for parties. The area around Dharmatala and beyond has a whole lot of suit tailoring shops like Akberally’s near Esplanade east and Shah Brothers on Madge Lane near Globe Cinema. Be prepared and patient – fittings take time. Choose the cloth and lining options carefully. And ask for several fittings so they can tweak mistakes like loose or tight fits around those tricky spots like armpits.